A second successful run at the Map of the Month, and with a conclusion to the school year and a portal into the next summer, I give you our Map of the Month second winner, by old time member and mapper, flothefreak, Dreamcatcher! Second place for this month's competition goes to a tie between Spiritforge by the old mapper Travin and Arden's pimpage of lnept's map Scopelense. Apparently observer versions are a thing of the past, currently there exists none for Spiritforge nor for scopelense, perhaps someone wants to ammend this so I can take out this rediculous statement? So again, congratulations to flothefreak for his one of numerous competition winning accomplishments here at bwm. Here's hoping you'll remain bwm's one and only nazi forever, as no one could ever take your place. A very historical competition for BroodWarMaps.net ends today. 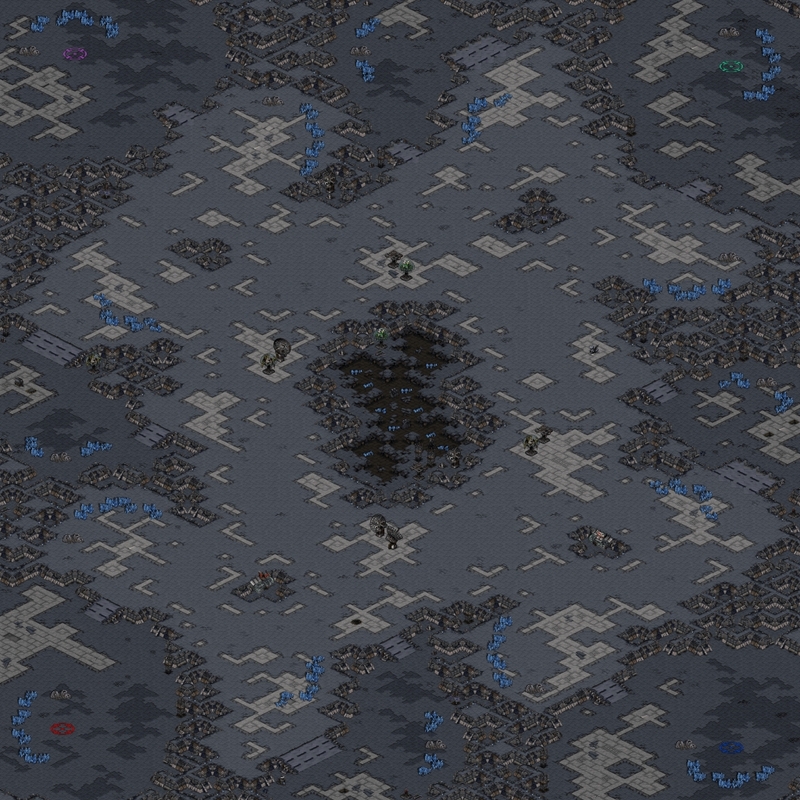 Our first Map of the Month has ended with (2)Angband 3600 ft. 1.2 by our very own Nightmarjoo! The concept of the map complicates gameplay in relation to most maps here at BWMN. With the only passage to each main being very small (approximately two grids wide), it makes players lean towards using island based play to fight their opponents which brings a different type of play out of players. The expos are very interesting as well. Many of the mineral lines are spread so that some of the gas nodes are unavailable until one or more minerals are mined out completely changing player's availability to gas dependent units. This is very nice for him as it is his first map he has ever had in the spotlight here at BWMN. Congratulations to you! Every month, when a MOTM has been made, we will also be posting the closest map to winning. (2)Jericho by LostTampon deserves just as much spotlight. It too promotes island gameplay in it's own way. It's set-up is simple without the use of spell sprites. The map's horizontal position's is it's best feature experimental wise, allowing intense micro battles but still the dwebs allow the time to expo and spread to other parts of the map - simply unique. Again Congratulations to Nightmarjoo with grabbing the first MotM here ever. Well the vote has spoken, long time mapper Arden wins another MOTW, and possibly the last MOTW ever! So what's so special about this map? Well for one the mains instead of being in the four corners, are in the two corners, similar to Space Lotus. Once you leave your nicely sized main, you have the option of taking a very low money mineral only at the choke of your nat, or take a normal nat at the choke of your main, similar to arcadia, although without as much macro effect with such a low mineral count mineral only. Pathing from you to the player closest to you by air takes you through the open middle, and past a semi island expo, where you can break neutral buildings to make it not island. If your enemy is across from you, on the same side, either east or west, you have a much closer path, and there are neutrals which obstruct some of the pathing, which you can if you so desire destroy to open up the game. Also, between these positions on the side is a gas expo on a cliff with ramps near both players. 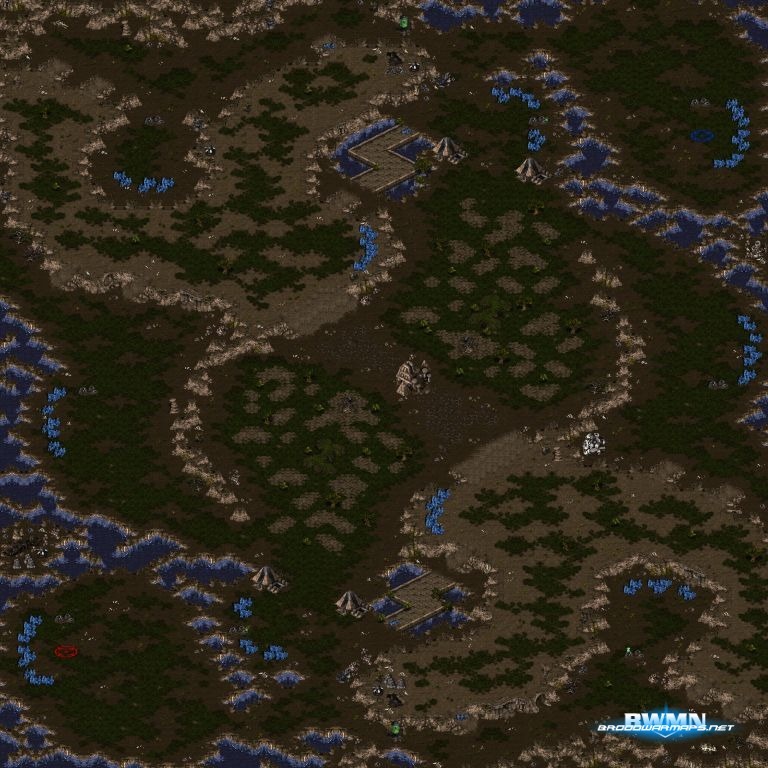 Anyone arguing the map is too tight will get flanked by these cliffs. If your enemy is in the opposite corner and opposite side, you have both the open middle and the tighter neutral blocked corridors to contend with. Also, in front of the nat entrance are minerals which tighten the choke a little, and of course you can mine your own or your enemy's to open that choke. With many different gameplay styles and possibilities, this solid map is sure to have some good games; a map nice enough to be worthy for both 1v1 and 2v2, Arden's (4)Deliverance is our MOTW! Congratulations, Arden. Nice to have you back and active here at broodwarmaps.net! Spam the map's thread here, download the map itself here, and for observing fun download the obs map here. A sad decision was made recently, within a week of April 1st 2007 Broodwarmaps.net will cease to exist. Very sad to announce, unfortunately Panschk was unable to continue maintaining the site's domain through the company. The rights to the domain were sold to some obscure Australian who can't speak English. On a lukewarmly bright side, a deal was made with mapdori.com to move the bwm database to their site. Of course bwm members will now all have to learn korean. Please see http://www.learn-korean.net/ for help learning the Korean language. (4)AquaRidge is one of Nasty's more recent pieces. This map claims its fame from the unique separation of the natural expansion from the main base choke. A skillful extension and manipulation of the badlands bridges provides a creative approach to what would otherwise be a somewhat standard layout. Combining an interesting concept with a balanced, flowing layout seems to be one of Nasty's many talents, and he pulled it off quite well with (4)AquaRidge. 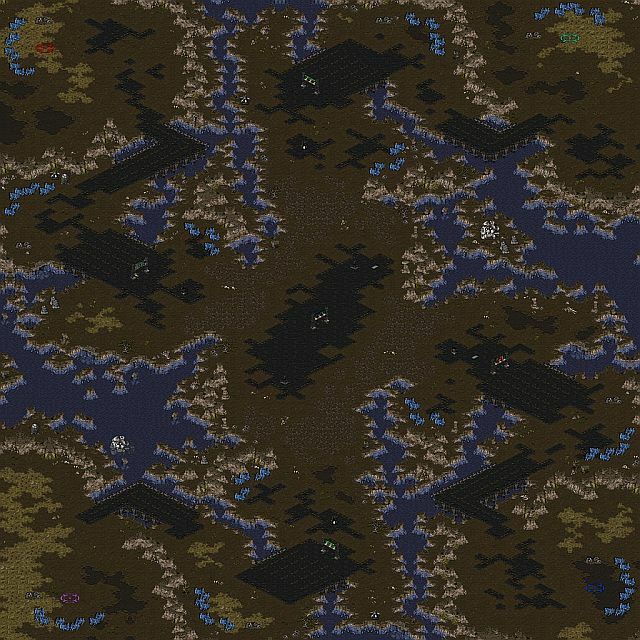 With support from the BWMN community and attention from BW gamers, I'm sure that this map will see its fair share of action on b.net.